At One Stop, we make it our mission to give back to the community that supports us. Each employee has pledged to donate their time to an individual charity of their choice, along with participating in company wide charity events. CEO Angella Luyk put the word out to her friends that she wanted to help families in need and would they donate an Easter Basket. 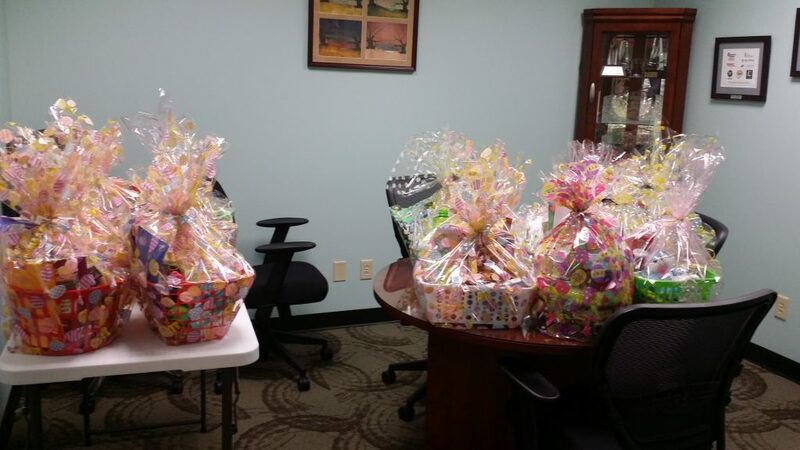 85 baskets later, CFO Harry Powell agreed to dress up as the Easter Bunny to hand them out. One Stop joins forces with IBERO-American Action League to collect Mid Year School Supplies. IBERO is building stronger families of all backgrounds in Rochester through its personalized work with each member of the family unit. Our educational programs target children, youth, parents and individuals with developmental disabilities. Just as we promote self-sufficiency, we as a nonprofit have also implemented new initiatives for our own self-sufficiency. These include our new Fee-for-Service Program and the upcoming launch of 97.1 El Poder; the first and only 24-hour Spanish radio station in Rochester. As a dual-language human services agency, we teach individuals of all backgrounds how to become self-sufficient. Through hands-on learning, we help children, youth, families and individuals with special needs transition into the classroom, the workforce and the community. Their programs are offered in both English and Spanish and have received numerous awards. One Stop teams up with Ronald McDonald house to donate Easter Baskets to the families staying at the house. Families are stronger when they are together, and their presence helps a sick child heal faster and cope better. While Ronald McDonald House Charities® cannot make medicine taste better or take away painful treatments, we can help lessen the burden and ensure families have the stability and resources to keep their child healthy and happy. 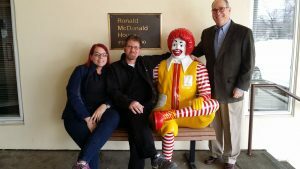 Last year, Ronald McDonald House Charities of Rochester, NY, supported more than 900 families and children, all because of the love and generous donations of our donors and volunteers. One Stop employees wanted to do something nice for local families. We wanted to give parents a chance to brag about their children. We sent out a Facebook message asking parents to tell us why their child is amazing. We received an overwhelming response. 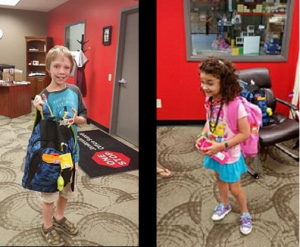 We chose one boy and one girl to receive a back pack full of school supplies. JA impacted over 4.5 million U.S. students in more than 197,000 classrooms during 2013-2014. Our CEO has been a longtime supporter of JA. Our volunteer-delivered, kindergarten-12th grade programs foster work-readiness, entrepreneurship and financial literacy skills, and use experiential learning to inspire students to dream big and reach their potential. With the help of more than 213,000 volunteers, JA students develop the skills they need to experience the realities and opportunities of work and entrepreneurship in the 21st century. One Stop Employees have pledged to do 50 Random Acts of kindness in the upcoming year. 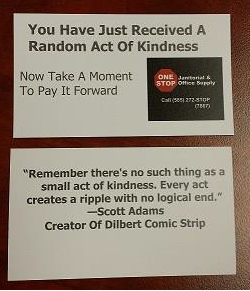 Each time they perform one the person will receive a card letting them know to pay it forward. 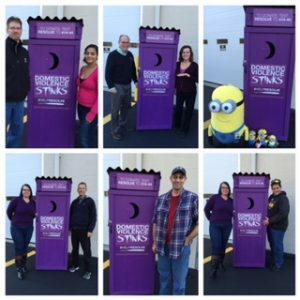 RESOLVE of Greater Rochester Inc. is heightening its efforts to raise awareness in the community and on college campuses throughout the month of October by declaring “Domestic Violence Stinks” across the front of purple-painted wooden outhouses. This whimsical campaign for a serious cause strives to draw attention to a frightening topic in a non-threatening way and to foster open dialog about the prevalence of domestic violence in our community; particularly in the suburbs, where more than half of all incidents are reported. The goal of the campaign is to acknowledge that domestic violence happens in every neighborhood; and to let people who may be suffering in silence know that they are not alone. Community members are invited to show their support by hosting the outhouses on their front lawn or businesses and by making a donation to RESOLVE, which develops and delivers innovative solutions that address domestic violence and sexual assault. 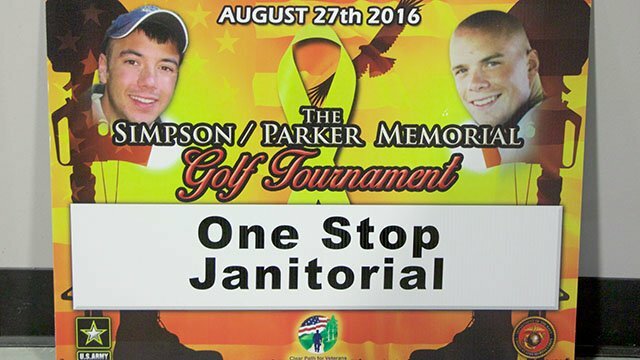 The Christopher Simpson Golf Tournament was started in 2012, to honor a true American Hero. Sgt Simpson was killed in the line of duty 17-March-08 in Baghdad by a road side bomb. 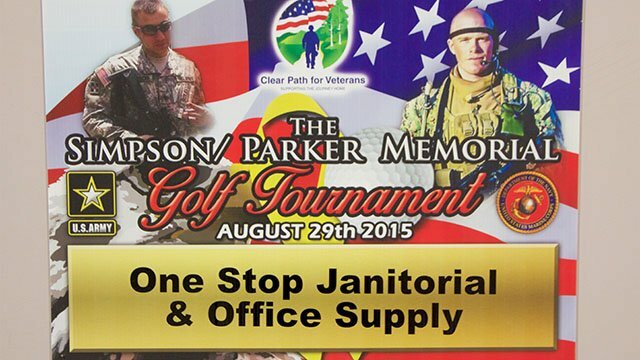 All proceeds went to Clear Path For Vets. Recognizing the responsibility of communities to help those who serve, Clear Path for Veterans empowers service members, veterans, and their families through supportive programs and services in a safe, respectful environment. 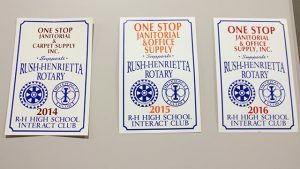 One Stop is a proud supporter of the Rush-Henrietta High School Rotary Interact Club. One Stop CEO, Angella Luyk was a guest speaker at the DECA Region 10 Installation Dinner and was presented a certificate of recognition for coming out to speak.